Gingerbread Diaries | Episode 2.1 No Drippy! It’s somewhat fitting (if a little frustrating) that we begin our second year of home repairs with more plumbing issues. But that’s the way it goes, and it actually turned out better than it could have. The worst-case scenario in this situation involved cutting a large chunk out of the ceiling. The upside is that it would have forced the issue on redoing the back hallway (which sorely needs it). To refresh your memory, this is the part of the house that used to be porch and was later enclosed. It’s pretty obvious that most of the issues with this particular add-on are from shoddy work when it was enclosed. Most of the issues wouldn’t have been very big while it was still breezeway or what have you, but the exterior that’s now interior has some severe, long-term water damage that will require new drywall at the very least, and possibly more once we actually open up the walls. 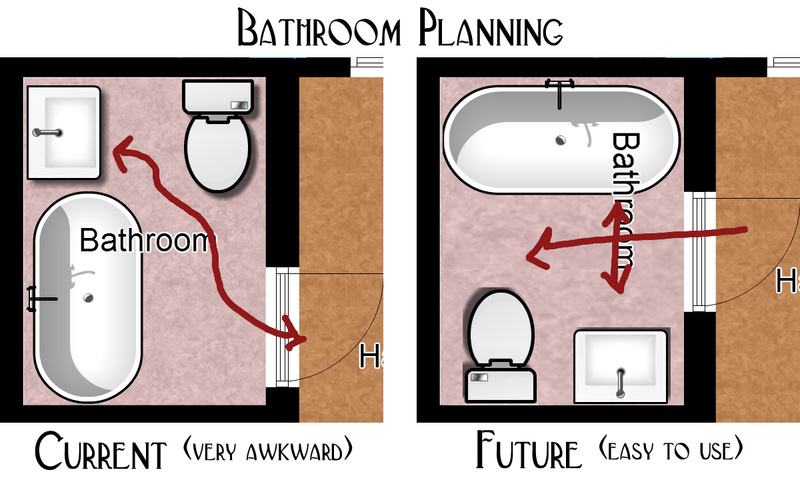 And when we tackle the drywall on the bathroom side of the hall, then we might as well deal with the water damage in the bathroom, as well (that was due to the roof, roof, not roof but window casing ridiculousness). But my plan is to do more than just replace the ceiling and drywall in there, I want to completely overhaul that room. It happens to be the worst laid out bathroom I’ve ever seen, but it can be improved it we rearrange the fixtures to better use the small space (approx. 5.5’x9′) and it won’t even be horrific as far as the plumbing is concerned because I can reuse the hot and cold lines that currently run to the sink for the tub. For the visual learners among us (myself included). What’s not pictured is a window Â in the center of the exterior wall. Yes, a window on a ground-floor bathroom that looks into the shower. The reset will put the window in line with the door for natural light (said window currently being blocked by a shower curtain) and a more appropriate placement. Sure, it’ll mean moving the door as well as the pipes, but the current state of the downstairs bathroom door shows that it was, at some former time, forcibly opened. We can only presume that one of the patients of the personal care home that was found themselves on the wrong side of the door one way or another. But replacing it will not be much of a hardship. I think one of the upstairs closet doors is the right side, should we want to keep to the current diminutive stature (that is, barely 2′ wide and short enough that our tall guests have to duck). We have a window where our shower will go (so excited we are putting one in) and it’s costing so much more to have it redone! Not the best plan! Good luck with your remodel when you do it! I know how happy you’ll be to have a shower upstairs!!! We were in that same boat for the first 6 months here and it’s just not fun! Good luck with your remodel. We have done plenty of them and it’s not very fun. I like the new layout much better. You will be so happy when it’s done! Thanks 🙂 We knew when we bought the house that it was going to be a long-term project as all 11 rooms need to be renovated eventually. At least we’re not in a hurry! Ugg! We have plumbing issues too! A leaky ceiling, yuck! I really like you new layout idea. Such a simple change can make a huge difference to ease of use! Thank you! That’s what I think, too. I mean, I understand why they did it that way (something I’ll be delving into on Friday’s post, now that I’ve got those wheels turning again) but really! I love home DIY projects but it seems like there is always a surprise or little glitch that happens (at least to me). Good luck! Remodeling always seem like it would be fun. Especially DIY projects with hubby. Good luck would love to see the end result. I’ve learned, on smaller projects, that we do work well together and I’m grateful for that–no reality show-level meltdowns for us! We’re looking forward to tackling each room in turn. Good luck on your remodel! We have two bathroom remodels on our to do list. So I’ll be sure to keep posted on your progress! Omgsh, it’s great that y’all are so well-versed in home repairs/remodeling! Y’all could probably make a killing helping others! That’s so sweet of you to say! Todd has worked in hardware stores off and on over the years either during school or as a second job back in the day–he knows his way around a lot of different projects. I’m best at the decorative bits! I am sure it will turn out beautiful! I updated our bathroom recently (not as much as you will be) and I love it. Good luck with remodeling your bathroom! From what I have seen in your updated post your colour scheme is going to blow other bathrooms out of the water. No pressure, right? 😉 I’m definitely looking forward to the change! We are starting to think of remodeling our bathroom too. Are you planning to DIY or hire it out? Good luck with all the remodeling! I’m sure it will turn out beautiful!